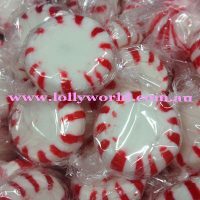 Starlight Mints Red & White are perfect for Christmas. With their red and white pattern and refreshing raspberry taste they are quite festive. Great for after dinner mints or table decorations also promotional giveaways. In each size you’ll find approx. 200g x 33, 500g x 83, 1kg x 167, 4kg x 668.